Egypt's Defence Minister Mohamed Zaki discussed military cooperation and the exchange of military expertise with commander of the US Central Command General Joseph Votel in a meeting in Cairo on Monday, the Egyptian Armed Forces said in a statement. General Votel expressed the US' keenness to support the strategic partnership and coordination between the militaries of the two countries. 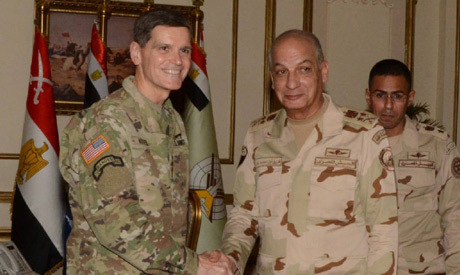 On Monday, Egypt's army Chief-of-Staff Mohamed Farid met with Votel and a delegation of US military officials, where they discussed the latest developments in the Middle East.